When Pam Weatherford learned she was invited to the Holy Land by the General Council on Finance & Administration (GCFA), she was incredulous. Her first thought: "I can’t believe they’re going to do it." Weatherford is administrative assistant to Bishop Jimmy Nunn of the Oklahoma Area. She regularly attends the meetings that bring together episcopal secretaries from throughout the Church. In early February, the group held its annual training in the cradle of Christianity. It was their first meeting at a location outside the United States. Weatherford was among 65 people, from across the world, to go on what she termed a "fantasy trip." They saw places in Israel and Palestine that they’d heard and read about all their lives. The trip enhanced the time Weatherford spends reading the scriptures. She said it’s helped her "visualize what I’m reading and hearing about." She added, "I’ve been in church all my life," but visiting the Holy Land has made "stories about Easter and Christmas come to life." The visit "deepened the understanding I had of the area, the landscape, the people." The challenges of living in the rocky, hilly areas she saw, imagining people in Jesus’ time "walking from place to place," impressed her. "It wasn’t like just walking up the road." A highlight for Weatherford and her husband, Chuck, was a meal in the home of a Palestinian Christian family. Weatherford called that visit "eye-opening." Their hosts served them chicken and rice, followed by tea and pastries. They discussed the relationship between Palestinians and Israelis and high hopes for their children: a girl, age 15, and two sons, ages 10 and 6. The daughter wants to become a math professor. The 10-year-old son peppered the Americans with questions about their lives and whether they voted for Donald Trump. Between Bethlehem and Jerusalem, the group’s bus was required to stop at a checkpoint, where armed soldiers walked through the vehicle to inspect it. The members of the police force looked "very young," Weatherford said, perhaps 18 or 20 years old. She estimated each tour member walked 12,000 to 13,000 steps a day during the eight-day trip. "They crammed a lot of stuff into those days," she said. The Weatherfords returned home with many memories, including seeing camels being led about, massive palm tree groves, houses packed tightly along hillsides, and many street vendors. "The street vendors are relentless," she said. Chuck, who is director of music and arts at OKC-Church of the Servant, said his favorite part of the trip was leading hymns during a Holy Communion service at St. Anne’s Church in Jerusalem. The group sang "How Great Thou Art" in the church rotunda, renowned for its acoustics. In addition to the time spent in training, the group took part in a mission opportunity at Bethlehem’s Hope School, which serves abused and neglected children. The Americans helped with gardening, picked up trash, and restocked the gift shop. The GCFA administers the denomination’s Episcopal Fund, which pays for episcopal office expenses and bishop salaries, including professional training for episcopal office support staff. Each participant also paid a discounted rate to attend. GCFA worked with corporate sponsor Educational Opportunities. 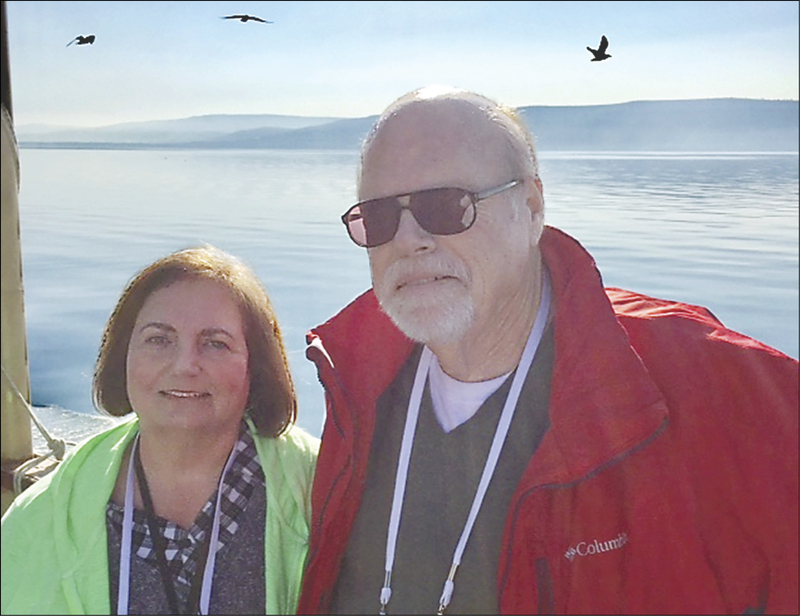 Pam and Chuck Weatherford ride a boat on the Sea of Galilee.